Dogs simply love to dig. If you have a dog, you have a digger -- it's what they do. 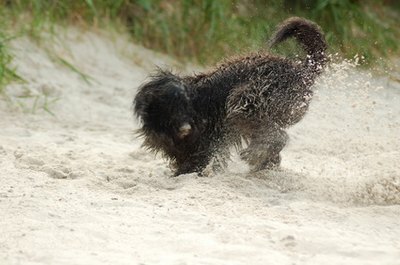 While teaching your dog not to dig is theoretically possible, you may find it easier to teach him that digging in the wrong place is neither fun nor rewarding. Your flowers won't care how you do it. When she begins to dig up the roses, offer your canine excavator the option of digging elsewhere. A sandbox in an out-of-the-way area of your yard or garden is a great alternative to soil in areas you have planted, especially if it also offers shade -- since many dogs dig to make a cool bed to lie down in. Distract your pooch with a favorite toy for a few minutes, then toss the toy in the sandbox. Hopefully, she will get the idea and stay there to play. Often a simple low fence around flowers will suffice to keep your dog from digging -- especially if you place it close to the plants, so he doesn't merely hop over to begin work. If that doesn't do the trick, try digging a shallow trench around the perimeter of flower beds and burying sections of chicken wire in them. With grass over the site, the wire becomes invisible. Your dog will quickly tire of digging where he is constantly thwarted by a wire-mesh barrier, and he will learn to avoid those areas. When laying out new flower plots, bury wire directly in the beds before planting to make it even harder for him to uncover flowers. The plants can easily grow up through the wire, and the mesh will help to hold roots in the soil as well. When all else fails it's time to get out the big guns. Not literally, but a few snaps, pops or squirts in the right place may teach Fifi that her appreciation of flowers is best confined to smelling them. The American Society for the Prevention of Cruelty to Animals recommends placing little mousetrap-like devices called “Snappy Trainers” around the flowers where she digs. When your dog attempts to dig in those spots, the traps will snap loudly and startle her without injury, so she goes elsewhere. Alternatively, hide a sprinkler in the middle of a flower bed she likes and turn it on just as she is settling in for a good dig. Turn it off immediately when she leaves. Be judicious using these or similar “tricks.” Never employ traps when you are not home to monitor them, and remember, turning the entire yard into a series of boobytraps may mean your poor dog will never go out at all. Leave her some safe spaces to play. Maybe the best way to get your dog to stop decimating your flowers is to better understand his need to dig. Bored, under-exercised and anxious dogs often act out their frustrations or need for physical activity by digging. It gives them something to do. Keep your dog happy and healthy with frequent walks and play sessions. Make sure he has plenty of alternative outlets by enriching his environment with toys and activities. For super-active dogs, consider agility training or set up a homemade agility course with tunnels to crawl through and things to climb or jump. Give a water-loving dog his own pool to play in. Most of all, give your dog the gift of your loving attention. That is the best distraction from digging any dog can have. Ceasar's Way: How Can I Get My Dogs to Stop Digging? Do Wheaten Terriers Like to Dig? How Can I Ship My Dog From State to State?